Anna Banana (née Anne Lee Long) was born and raised in Victoria, BC. The origin of the name “Anna Banana” is accredited to her friends at the free and experimental New School in Vancouver when she was teaching back in 1968. After falling into a box of bananas in 1970, Anna Banana accepted the moniker and later adopted it as her legal name in the year 1985. Banana has worn many hats as a curator, writer, and former public school teacher, but she is perhaps most well known for her work as a performance artist and independent publisher. Presenting dynamic public events like “Banana Olympics” (1975), “Going Bananas Fashion Contest” (1982), and her extensive involvement with the International Mail Art Network (IMAN) and the Stamp Art movement, humour and connectivity are common strategies for Banana that allow her to “challenge authority and engage the audience in a creative act.” Other notable publication projects include: the Banana Rag newsletter (1971), VILE magazine (1974) with Bill Gaglione, International Art Post (1988), Artistamp News (1991-1996), and the Artistamp Collector’s Album (1990). In 1973, Banana moved to San Francisco where she became involved with the Bay Area Dadaists, a group “interested in Dada, Fluxus inspired events, situationist provocations, mail art, rubber stamps, and self-publishing.” The group is considered to be a precursor to the alternative music, social and zine publishing scenes that would emerge shortly after in the Bay area. Bill (William / “Picasso”) Gaglione was one of the key figures of this movement, and his engagement with Mail Art remains ongoing. Banana and Gaglione’s shared interests allowed for a creative and collaborative partnership to flourish throughout the 1970s. Banana performed Dada Sound Poetry and Italian Futurist Sintesi with the Bay Area Dadaists, and in 1978, Banana and Gaglione debuted Futurist Sound on a European tour, performing the work in thirteen different countries and twenty-nine cities. The program was then expanded and re-titled “Toward the Future” as they travelled through another fourteen cities, and finally, across Canada in 1980. 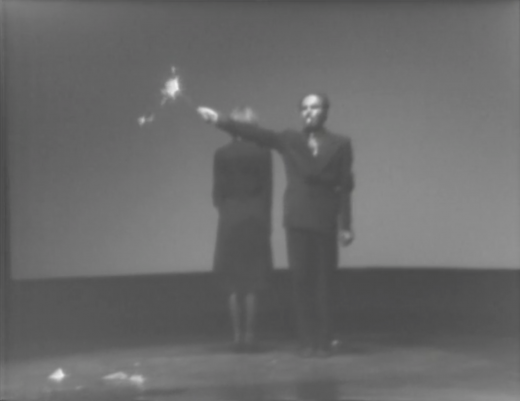 The performance of Futurist Sound at Western Front took place in 1979 as part of the Living Art Performance Festival: an ambitious multi-day event that took place in a variety of venues across Vancouver, and was comprised of live performances and “performance tape” screenings. Futurist Sound is a re-enactment of fourteen Futurist sintesi: short plays considered by Banana and Gaglione as “the forerunners of contemporary performance art”. These short plays were debuted at Futurist-style theatrical events known as serate, evenings that typically presented provocative performances and noisy instruments as a means to provoke, stir controversy, and challenge traditional modes and social customs of theatre. Considering that the original sintesi acts were created in the 1910s and 20s, and Banana and Gaglione’s performance in 1979, the anachronisms found within the performance’s content are plentiful. Today, the Futurists and their leader F.T. Marinetti are notorious for their nihilistic views and misogynistic stance towards women, a reputation that makes the viewing of Futurist Sound uncomfortable at times. Many aspects of the performance, however, are highly entertaining: presenting dynamic experimental readings, nonsensical acts, and expressive acting. As a series of “recreations,” the likeness of Futurist Sound to the original sintesi performances can also be queried: Have the artists altered the script? Used alternative props? Produced their own choreography? Switched gender roles? The full extent of their intervention in the original Futurist script is left intentionally ambiguous, exemplifying the adaptability of the serate form. 1 – MacMillan, Misty-Dawn. “Readers Advisory—Anna Banana.” Artexte, 2011. Accessed April 2018. 2 – van Burden, Zora. “Anna Banana.” In Women of the Underground: Art: Cultural Innovators Speak for Themselves. First edition. San Francisco, CA: Manic D Press, 2012. Accessed 2012. 3 – Mail Artists Index. November 27, 2007. Accessed April 2018. https://mailartists.wordpress.com/2007/11/26/anna-banana/. 5 – Lomholt Mail Art Archive. Accessed April 2018. http://www.lomholtmailartarchive.dk/networkers/anna-banana. 6 – Held, John, Jr. “Before Punk and Zines: Bay Area Dada.” Before Punk and Zines: Bay Area Dada. March 21, 2010. Accessed April 2018. http://stendhalgallery.com/?p=3504. 8 – Mail Artists Index. 9 – van Burden, Zora. 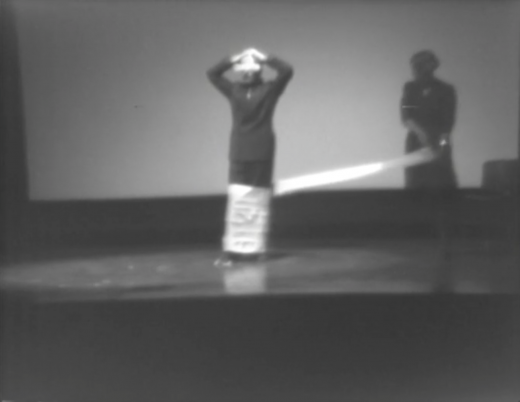 10 – Anna Banana describes the form of the sintesi at the introduction of the Futurist Sound performance. 11 – Article #9 from the Futurist Manifesto by F.T. Marinetti states: “We want to glorify war—the only cure for the world—militarism, patriotism, the destructive gesture of the anarchists, the beautiful ideas which kill, and contempt for woman.” From Marinetti, F. T. The Documents of 20th-Century Art: Futurist Manifestos. Edited by Umbro Apollonio. First edition. New York: Viking Press, 1973. Performance of 14 sintesi written by the Italian Futurists by Anna Banana and Bill Gaglione as part of Vancouver Living Art Performance Festival, coordinated and curated by Glenn Lewis, Paul Wong, and Kim Tomczak with the collaboration of several curators and many artists that animated many spaces throughout the city.